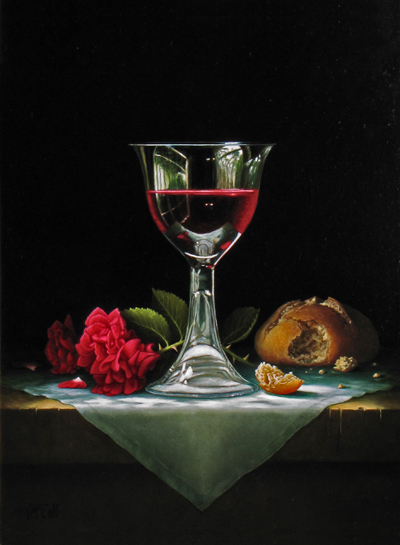 Some time ago I was commissioned by dear friends to create this painting, titled “Communion.” This evening in particular seems a good time to share this image as Christians around the world celebrate the Last Supper where Jesus commanded His disciples to remember His sacrifice with bread and wine. I decided to add a little meditation on the painting with my post, and found that as I wrote, what I wanted to say kept trying to emerge in verse. I was enjoying the process, so I went with it. I was very hesitant to post my very novice poetic efforts here, but decided to go ahead, hoping that I will find some forgiveness for my literary deficiencies in deference to my message and intent. A trinity of thorny-stemmed roses bleed soft red petals on white linen. The broken loaf awaits gouging fingers, open mouths, gnawing hunger. Mercy’s meal - gnashed, swallowed, savored in faith, becomes our healing. Pouring in, flowing down with holy rushing purpose - to wash, to free, to seal. Distilled from brutal crush, forgiveness pools forever in that bottomless cup. Into the Fire that leaves no ash, only green, budding hope and crystal vision. Wowwwwww! That is spectacular! Both the painting itself and the beautiful prose in description. Well, we’ll done. Always exciting to see the hands of God at work in the lives of people. Thank you Danny for your kind, affirming comments!